Although legendary saxophonist John Coltrane first gained attention for his revolutionary ‘sheets of sound' technique, it was the deep spirituality of his music that really made his recordings as a bandleader such classics. The albums this giant of music recorded for Atlantic in 1959 and 1960 really represent the heart of his legacy. 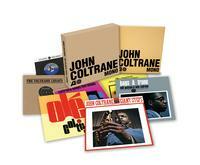 John Coltrane's life will be the subject of a new documentary (tentative title: "Chasin' Trane"), out later this year, and now, for the first time since their original release, this box set gathers his mono recordings from the Atlantic vaults. Packaged in an elegant cloth-bound box. Fully remastered in glorious mono. Original studio albums in glossy tip-on LP sleeves, replicating the original artwork and labels. Giant Steps (1960), Bags & Trane (1961) with Milt Jackson, Ole Coltrane (1962), Coltrane Plays The Blues (1962), The Avant Garde (1966) with Don Cherry. One LP of outtakes and a replica of the original ‘My Favorite Things Part I & II' 7-inch single, a hit for John Coltrane in 1961. A 12" x 12", 32-page, perfect-bound booklet, with period photos by Lee Friedlander and liner notes. Liner notes by Grammy-winning jazz writer Ashley Kahn. My Favorite Things Part I.